Sometimes one of something just isn’t enough, like one potato chip, one glass of wine… And when it comes to lifting massive objects one simple pulley isn’t going to be enough to get the job done. Even the improved simple pulley, which we introduced last week, is often not enough, a situation which I’ve run across in my career as an engineering expert. 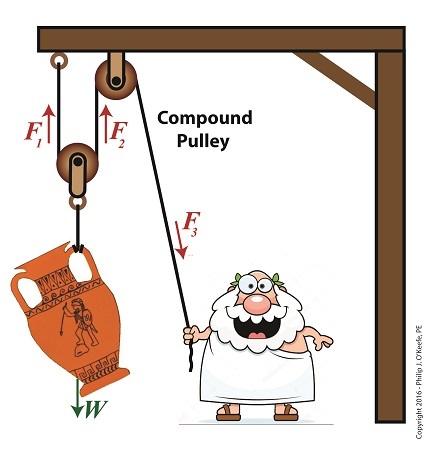 To get past the limitations of the simple pulley and improved simple pulley, ancient Greeks went on to devise the compound pulley, which we’ll introduce today. A compound pulley, such as the one shown here, consists of two or more simple pulleys. In the compound pulley system, a combination of fixed and moveable simple pulleys are used to lift objects. The scenario shown in our illustration features a compound pulley consisting of two simple pulleys, one is stationary and affixed to a beam, the other hangs freely in space, riding on the rope connecting them. One end of the rope is held by Mr. Toga, the other end is affixed to the beam. In fact, all compound pulleys require that at least one simple pulley be affixed to a stationary structure, and at least one other simple pulley must be free to move in space. When our toga clad friend pulls his end of the rope he exerts a force, F3, via the pulley affixed to the beam. This force transmits on to the pulley attached to the urn, which results in lifting the urn off the ground. Next week we’ll calculate the force on Mr. Toga’s end, F3, as well as the other forces at play, F1 and F2.